As the cost of hardware continues to fall, IT projects still experience budget overruns, which in some cases result in the abandonment of the projects. It could be argued that a lack of understanding of the indirect costs associated with IT/IS investments is a major contributor towards this phenomenon. 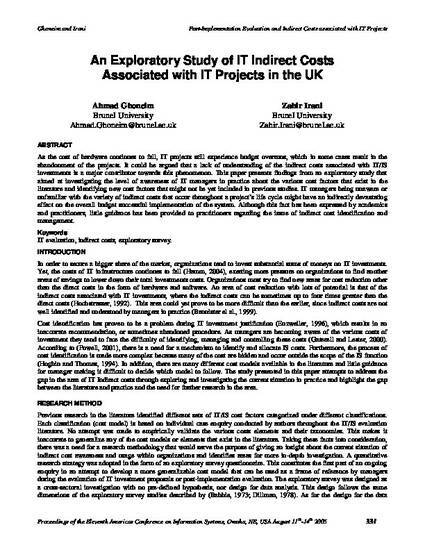 This paper presents findings from an exploratory study that aimed at investigating the level of awareness of IT managers in practice about the various cost factors that exist in the literature and identifying new cost factors that might not be yet included in previous studies. IT managers being unaware or unfamiliar with the variety of indirect costs that occur throughout a project’s life cycle might have an indirectly devastating effect on the overall budget successful implementation of the system. Although this fact has been expressed by academics and practitioners, little guidance has been provided to practitioners regarding the issue of indirect cost identification and management.